The first feature of the 2018 Budget is the allocation of $100 million to the America’s Cup. The politics of this are not hard to understand, but the myth of prioritising within an economically-binding fiscal constraint is exploded. Explicitly prioritising the America’s Cup above mental health and Maori development leaves no space for any argument that there is “not enough money” to boost these areas of need. The revealed truth is that the constraints on fiscal policy are political, with no basis in objective economic scarcity: the resources are there, but the political will to capture and deploy them with a ruthlessly Rawlsian focus on the disadvantaged is not. The 20%-of-GDP debt target and 30%-of-GDP spending target reflect just a need to appease the ideological obsessions of a “business community” and “middle New Zealand” still wedded to the low-tax-small-government neoliberal mindset. The second feature of the Budget speech and commentary is a failure to connect the fiscal stance to the macroeconomic context within which fiscal policy operates. The dominant neoliberal narrative over recent decades has portrayed government as a household whose primary goal is to balance its books, regardless of any effect it may have on the economy as a whole. That links to the further neoliberal proposition that fiscal policy is powerless, leaving monetary policy (operated by an independent inflation-targeting central bank) as the sole means of stabilising the macro-economy. When Jacinda Ardern equates fiscal surpluses with a “strong economy” she is not just making a token sacrifice at the neoliberal shrine. She is explicitly rejecting the older insights of the Keynesian approach to fiscal policy that the Labour Party owned until 1984. Without that intellectual heritage to draw on, the current generation of Labour politicians struggle to explain exactly how their fiscal strategy translates to economic strength for the nation – as distinct from a strong Government balance sheet, or the business community’s collective ego and rents. 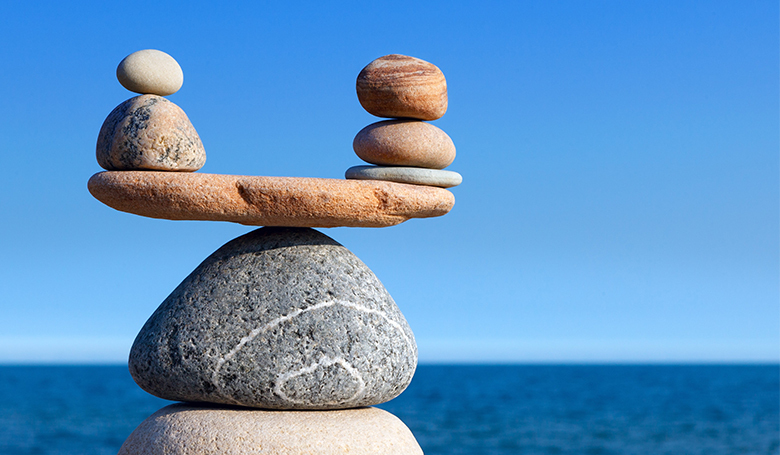 New Zealand is an open economy which runs a persistent deficit on the current account of its balance of payments, and which has a correspondingly weak national balance sheet. 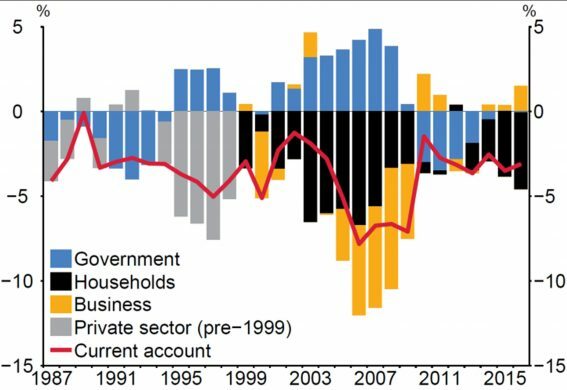 The counterpart to the Government’s surpluses is private sector deficits that become liabilities on household balance sheets. 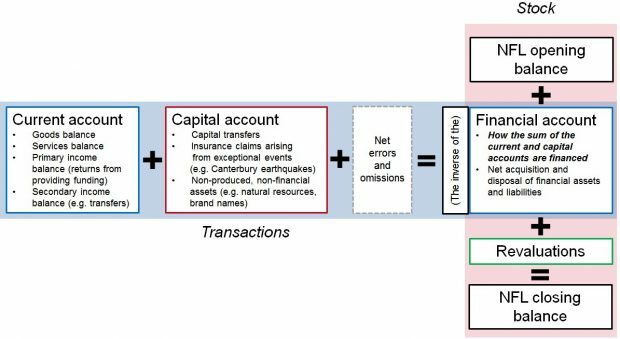 This says that except when something big (such as Christchurch earthquake reinsurance) happens in the “capital account”), a persistent current-account deficit increases in the country’s Net Foreign Liabilities (NFL). These come in two forms: overseas ownership of productive assets in the economy, resulting from foreign direct investment, and debt owed to overseas lenders. That debt, owed partly by the Government and partly by the private sector, is the debt that matters for the national economy’s “strength”, and is not to be confused with the government debt with which the “fiscal responsibility rules” are obsessed. My story here (not Bascand’s, please note) runs as follows. 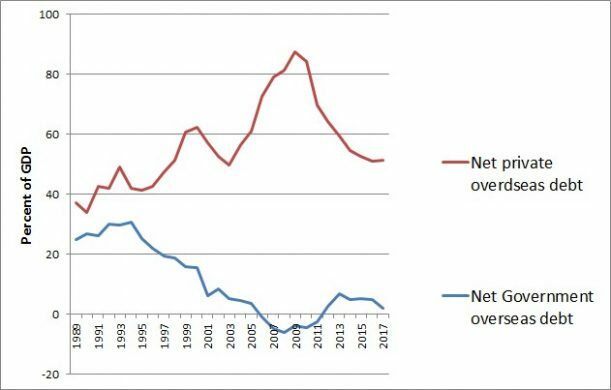 In the early 1990s the Government’ fire sale of state assets to pay off debt was the prime driver of the financial inflow (increased NFL) corresponding to the current account deficit around 1991-4. Government then proceeded to pay down its foreign debt from domestic sources in the late 1990s while the private sector borrowed heavily, contributing the financial counterpart to the current-account deficit. After 2000 the Government’s offshore debt-reduction resumed, while another surge of household borrowing (organised and pushed along by the banks) secured offshore financing for the current account deficit as it worsened to 7% of GDP. Then came the 2008 crisis: the household sector virtually disappears from the chart for four years, while Government did the borrowing. Then the quest for fiscal surpluses resumed and household borrowing once more became the prime contributor to the current account deficit. 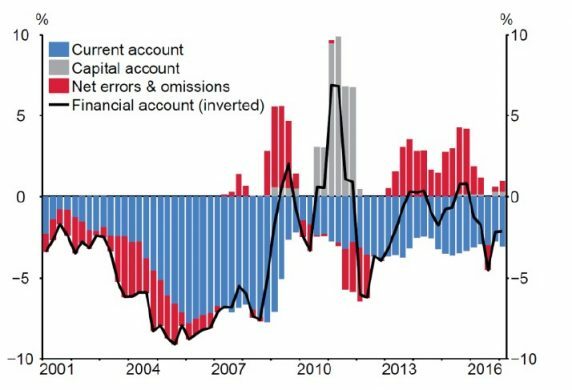 There is no sign at any stage in the past three decades that a tightening of fiscal policy has improved the balance of payments current account. The impression is rather that the economy’s propensity to run a 3%-of-GDP current deficit is baked-in. Labour’s determination to run fiscal surpluses has to mean rising household indebtedness – every dollar of debt paid down by the Government must be replaced by a dollar of additional private debt, unless it is accompanied by an improvement in the current account sufficient to reverse the annual buildup of total debt. All of this matters because private debt becomes toxic beyond a certain level. One big lesson US economists are drawing from the Global Financial Crisis is that excessive household debt, underwritten by booming house prices and encouraged by deregulated banks, was the crucial factor in explaining the long and deep recession that followed the collapse of the housing boom in the US economy. New Zealand’s households carry mortgage-debt liabilities sufficient to trigger a big drop in consumption, and hence in GDP, if house prices drop or interest rates rise. The “fiscal responsibility rules” increase this risk. A. Mian and A. Sufi. (2014). House of Debt: How they (and you) caused the Great Recession, and how we can prevent it from happening again. University of Chicago Press. 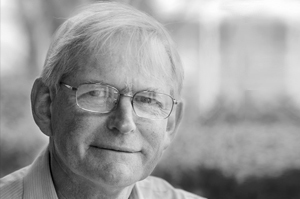 Dr. Geoff Bertram, a Doctor of philosophy graduate from Oxford and a long-serving senior economist at Victoria University Wellington has been at the forefront of economic policy writings and discussions for many years. His research interests include the regulation of public utility industries such as electricity, gas and telecommunications; the economic and political development of small island societies with a particular focus on the Pacific; the design of policies to address climate change; and the long-run evolution of the New Zealand economy. Dr. Bertram has over 100 publications including more than 50 peer-reviewed journal articles, books, and book chapters. He served on the Council of the International Association for energy Economics from 2005 to 2007 and convened the Association’s annual conference in Wellington in 2007. He has been a member of the editorial boards of a number of international journals including World Development 1992-97, Environment and Development Economics 1996-2006, and Asia Pacific Viewpoint since 1976. He is a regular commentator on energy, climate change and small-island states.